Raw, unrefined Shea butter contains vitamins and minerals such as vitamins A and E, as well as essential fatty acids. It has been used for centuries for its moisturizing, anti-inflammatory and anti-aging properties. 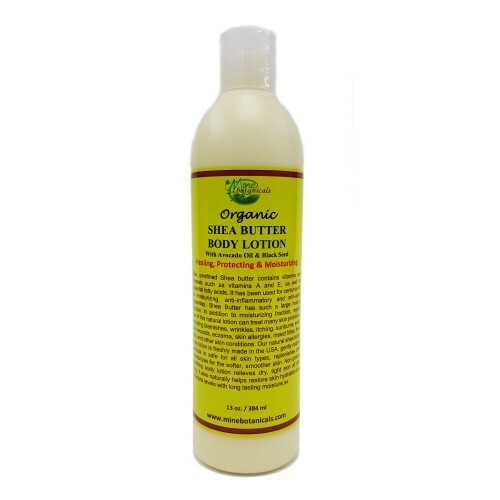 Shea Butter has such a large healing fraction, in addition to moisturizing fraction, regular use of this natural lotion can treat many skin problems, including blemishes, wrinkles, itching, sunburns, small skin wounds, eczema, skin allergies, insect bites, frost bite, and other skin conditions. Our natural shea butter body lotion is freshly made in the USA, gently natural formula is safe for all skin types, replenishes and moisturizes for the softer, smoother skin. Non greasy soothing body lotion relieves dry, tight skin all day long. It also naturally helps restore skin hydration and moisture levels with long lasting moisture. Use: APPLY DAILY TO THE WHOLE BODY, IDEALLY AFTER WASH OR SHOWER WITH SHEA BUTTER SOAP OR BODY WASH. GENTLY MASSAGE IN. USE TWICE A DAILY. INGERDIENTS:- RAW BUTYROSPERMUM PARKI (SHEA BUTTER), BLACK SEED, AVOCADO OIL, DEIONIZED WATER, COCONUT OIL, COCOA SEED BUTTER, JOJOBA OIL, VEGETABLE GLYCERIN , ALANTOIN (CELL REGENERATION, HYDRATION) , TOCOPHEROL (VITAMIN E) , PALM KERNEL, CETEARETH 20 (EMULSIFYING WAX) , OLEA EUROPEA (OLIVE OIL) , ALOE BARBADENSIS LEAF JUICE, GRAPEFRUITS SEED EXTRACT & NATURAL FRAGRANCES.